Livestock agriculture accounts for 65 per cent of global N2O emissions (Steinfeld et al, 2006). 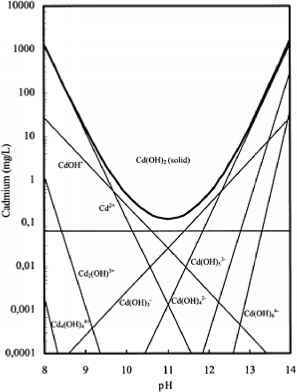 This N2O is largely produced by the soil microbial processes of nitrification and denitrification, which convert ammonium and nitrate nitrogen cycling through the animal/plant/soil system into N2O (Figure 6.1). In livestock agriculture, N enters this system mainly through N fertilizer applications and biological N fixation by legumes. However, a relatively large proportion of these N inputs is subsequently recycled within the system via grazing ruminants that generally utilize very little of the N in feed and excrete between 75 to 90 per cent of ingested N (Whitehead, 1995). This N is excreted either directly on to pasture as urine and dung, or in animal housing systems and then applied to land as effluent or manure. Consumption of livestock products has increased substantially in the past decade, with exponential increases in areas such as Latin America and East Asia (Steinfeld et al, 2006). This increase in demand for animal-based protein has been driven by increasing affluence and urbanization of a growing and ageing population, which in turn has driven the intensification of the livestock sector. Current projections are that, by 2050, the world population will reach 9 billion and that both milk and meat production will grow exponentially to meet the demand. The growth and intensification of livestock systems will have a major environmental impact, including increased N2O emissions, and will require sustainable mitigation options for minimizing emissions whilst maintaining the required livestock production levels. Livestock systems can broadly be categorized into pastoral, confinement and hybrid systems (Kleinman and Soder, 2008). Pastoral systems are most common in the Southern Hemisphere: in Australia, New Zealand, Africa and Latin America. These systems are land-based and livestock graze pasture or fodder crops generally all year round. The use of imported feed or supplements is limited. The pastures are often legume-based and both biological N fixation and N fertilizer are important N inputs to the system (Wassermann, 1979; Ledgard and Steele, 1992; Ledgard, 2001). Confinement systems are 'landless' (Oenema, 2006) and primarily import feed and supplements for their livestock that is (predominantly) housed or confined in barns or feedlots. These systems are most common in North America and parts of Europe where animals are typically kept at high densities and largely grain-fed. The N inputs into these systems are mainly through imported feed and supplements. Hybrid systems, as referred to here, are those that combine both pastoral and confinement elements, with animals spending roughly equal amounts of time either grazing pastoral land or being housed indoors and fed on imported supplements. These systems are typical in European countries such as The Netherlands, the UK and France. The main N inputs into these hybrid systems are typically N fertilizer and N in imported feed and supplements. The three livestock systems each have different impacts on the N cycle and on the key sources of N2O. 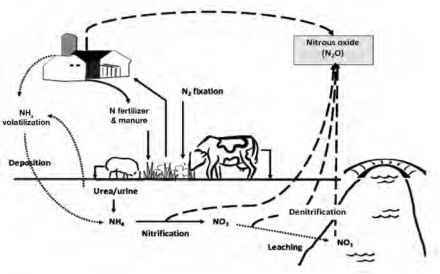 For example, in pastoral systems, N excreta deposited to pasture by grazing animals can contribute up to 85 per cent of the total N2O emissions, whereas in confined or hybrid systems the main sources are N fertilizer and animal manure (Figure 6.2).